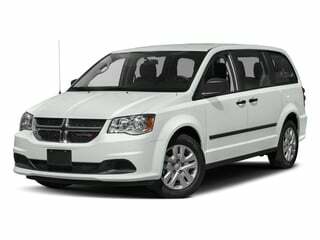 Be the first to review this 2018 Dodge Grand Caravan. Grand Caravan SE ($25,995) comes with seven-passenger seating, three-row power windows, keyless entry, heated power mirrors, Stow ‘n Go third-row seat, a rearview camera, a 6.5-inch touchscreen infotainment system, and 17-inch steel wheels. Bluetooth connectivity is part of a Uconnect Handsfree option package. All Grand Caravans can get rear-seat DVD entertainment with a 9.0-inch screen. SE Plus ($28,695) includes the Handsfree package, premium cloth upholstery, second-row Stow ‘n Go seating, alloy wheels, and a Blacktop appearance package. Captain’s chairs substitute for a bench in the second row. Grand Caravan SXT ($31,395) adds leather upholstery, a power driver’s seat, automatic headlights, foglamps, power sliding doors, remote start, a roof rack, and gray alloy wheels. Options include heated front seats, a heated steering wheel, and Garmin in-dash navigation. Acceleration from the strong V6 engine is admirable, sufficient to propel the Grand Caravan with a sense of authority. The 6-speed automatic shifts promptly, not often impeded by annoying gear-hunting. The engine is well-muted, as if it’s actually some distance away from the minivan occupants. At times, hard acceleration can cause the steering wheel to pull toward one side. Unfortunately, that impressive powertrain cannot overcome the Grand Caravan’s lumpy ride quality, stemming from its firm suspension and a weak overall structure. The firm ride seems to transmit pavement flaws right into the cabin’s trim pieces. Don’t be surprised to hear a periodic rattle from interior fittings. On the other hand, even when traversing rough terrain, sounds from the outside world are commendably subdued. Grand Caravan fuel economy is beaten by newer designs such as the Chrysler Pacifica and Honda Odyssey. Grand Caravan is EPA-rated at 17/25 mpg City/Highway, or 20 mpg Combined. Despite its demerits, including weak safety scores, the Grand Caravan does offer quite a bit for its value-focused price. Discounted prices shouldn’t be hard to find. Still, topping the Grand Caravan in spaciousness, the far more modern Pacifica also earns greater safety scores and is substantially better-equipped. Especially in base trim, the Grand Caravan has quite a meager standard-equipment list.